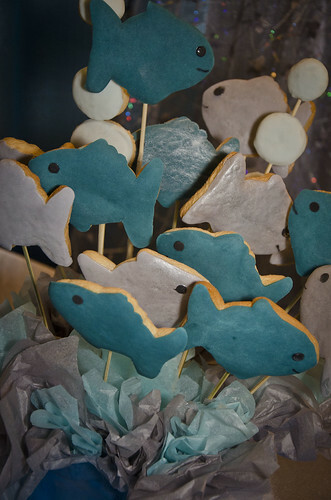 A Fishing Wedding Theme. Get hooked on love! If you are a free spirit that loves the outdoors and being surrounded by nature is your thing, throw all your misconceptions about this theme out the window and have a unique yet elegant celebration! But enough talking, let's get to the details so we can get this party started! This theme can be as fun, modern or elegant as you want it to be. Your wedding invitations should be a reflection of the celebration you are preparing. First things first. Find the right venue for you. A cute idea is to have your ring bearer carry your rings with a cute fishing doll. You can tie the rings to the end of the doll’s fishing pole. Another idea is to give your guests some fishing rods an instruct them to create a virtual archway, which you will walk under to exit the ceremony. Set your tables with fishnet on top of your tablecloths, as an overlay, and if you desire decorate them with table confetti. If your wedding is indoors, use a themed props to set the theme. If you know someone that owns a canoe, borrow it for your wedding day. Use it as a decoration or picture spot in your venue. You could also use some Adirondack chairs for this purpose. Decorate them with a couple of fishing rods, (remove the hooks before placing them), fishnets, etc. For a fun (and sweet) centerpiece, buy some glass bowls and fill them with beads or hard candy in fish shapes standing on top of it. A more delicate centerpiece will be a floral arrangement or some candles on top of a glass or mirrored tray. If you want to give this centerpiece a more rustic look, place some stones around them. A delicate and elegant centerpiece for a fishing wedding theme could also be one made with dry twigs and branches.